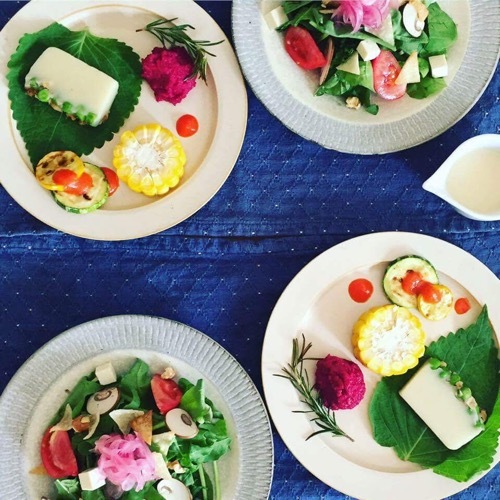 The Lito Rukka is an organic vegan restaurant using a chosen space within a private house, and has recently opened on the 30th September. When we visited the restaurant with such a pretty appearance, we found high quality and delicate meals and heartwarming hospitality! Click here for location and detailed information on Lito Rukka. 1 Please appreciate a special time for yourself. This restaurant provides busy people with a time to sit back and relax. 3 The chef’s mum raised her with vegetarian food with the wish that she would be a healthy child. The wish has been passed on to the new generation and to many more customers.. Please appreciate a special time for yourself. This restaurant provides busy people with a time to sit back and relax. Pretty and delicious looking plates are lined up. Surprisingly, the above is not a restaurant somewhere in the central district of Omotesando Tokyo! 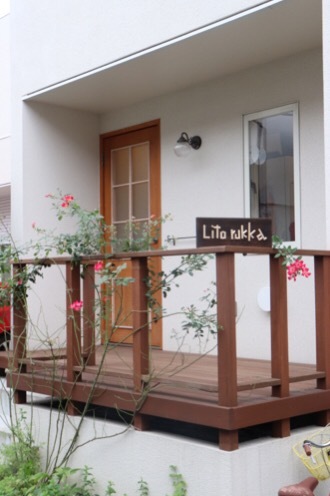 The Lito Rukka is set inside a residential area, near the train station in Nerima-ku. 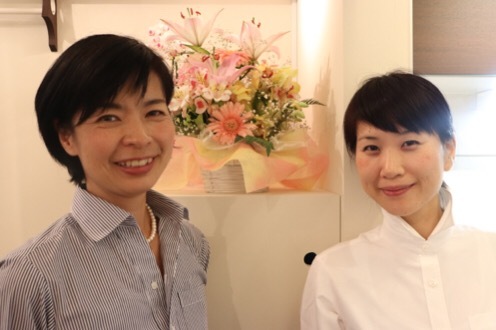 The owner of the restaurant Ms. Yoko Matsuura used to be a flight attendant. Now as it is the era in which more people will live to the age of 90, and facing her retirement she has thought about what she was going to do next. When she decided her home would be newly constructed, she thought of opening a restaurant and spending the rest of her life with it. 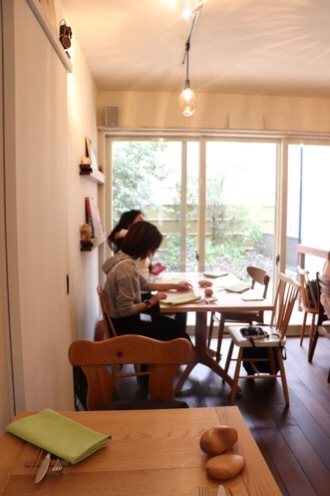 Originally, Ms. Matsuura’s had developed the idea to open her own café while she was raising her kids. There was no restaurant or cafe where you could take your children with you and relax, and she thought she could create one herself. 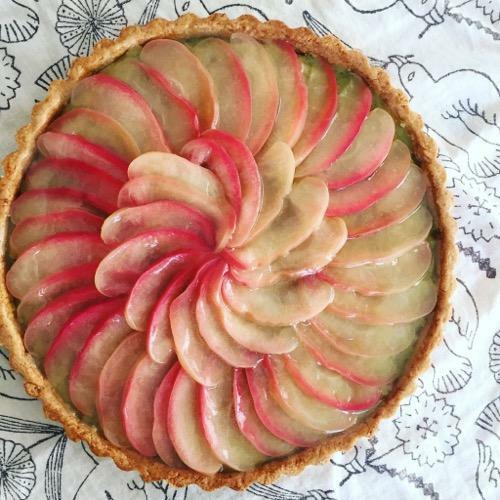 As time passed, she realized the importance of “having time for oneself”, rather than “time with children”, and her concept has shifted from a child friendly café to a restaurant for grown ups. 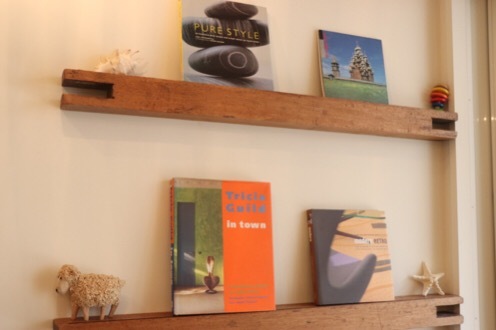 Wooden furniture and the signboard create a soft and warm atmosphere. These were handmade by her husband who makes furniture to order. Lito Rukka wants to be environmentally friendly. It does not want to waste any ingredients and it wants to have a low impact on the environment. Based on these thoughts, the restaurant is only open on Friday and Saturday and by advanced reservations only. The chef will plan the menu depending on the vegetables received on Thursday, without wasting any. and purchasing vegetables from natural farming and seasonal organic vegetables from “a small Kokusai-Kobo (grain and vegetables workshop) Morineko” in Fukuoka which is run by the chef’s sister. The above lunch menu has two options: a lunch course and a full course. 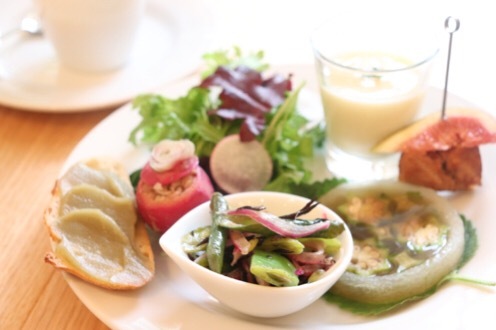 During our visit we tried the lunch course (2,500 yen inc. tax). With an additional 300 yen, you can have a set drink which is tea or coffee. The above image is an assortment of appetizers. You can see the meticulous work by closely observing each item. Wow! The smoked vege-meat is beyond your wildest imagination! The Pintxos (small finger food) is a piece of fig set on top of bread. We could not help but wonder how someone could come up with such a combination. 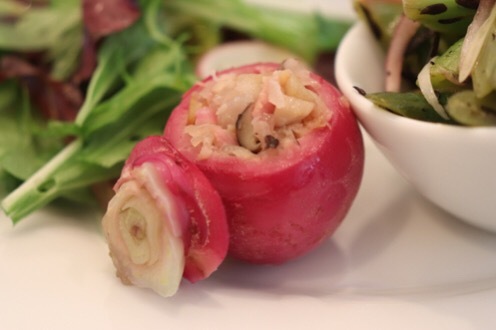 Culled turnip was used for stuffed food. As it is tiny, it requires from the chef fine and delicate work. The above image was posted @dokin_instagram who is a member of the Vegewel Club. 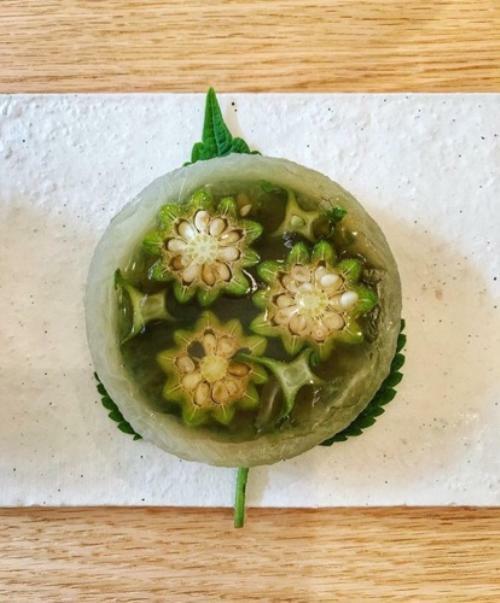 She visited the restaurant on the same day as us and had this terrine with wild Perilla leaves and white gourd-melon. It’s a work of art! 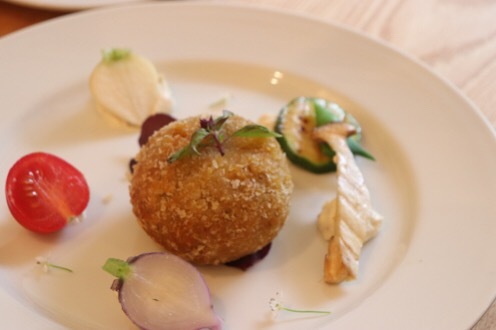 Today’s main was a pumpkin croquette which was filled with hempseeds. The above dish was part of the full course menu, rosemary and beets potage and steamed eggplant paste with baguette. The above is the dessert from the full course, and is an assortment of vegan items, it looks gorgeous! 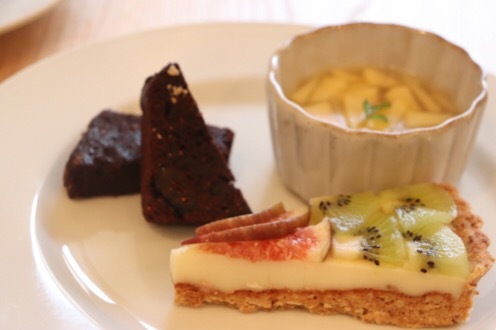 Today’s desserts were dried fig chocolate cake, fig and kiwi fruit tart, and apple kudzu (Japanese arrowroot) jelly. 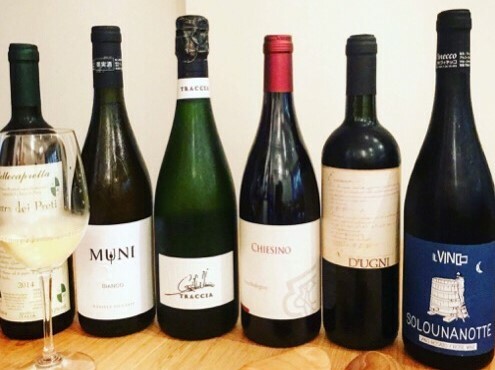 These natural wines are from the owner’s special selection! 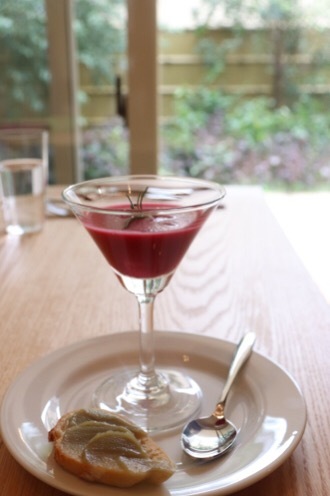 It’s delightful to note that a glass of Biodynamie wine is only 600 yen (inc. tax). Biodynamie wines are made employing organic farming methods to grow the fruit, while also using a planting calendar that depends upon the movement of the moon and stars. Why don’t you have a relaxing time whilst enjoying a meal and a glass of wine? The chef’s mum raised her with vegetarian food with the wish that she would be a healthy child. The wish has been passed on to the new generation and to many more customers..
Lito Rukka’s Chef Ms. Aiha Asada. Ms. Asada was raised on a macrobiotic diet. 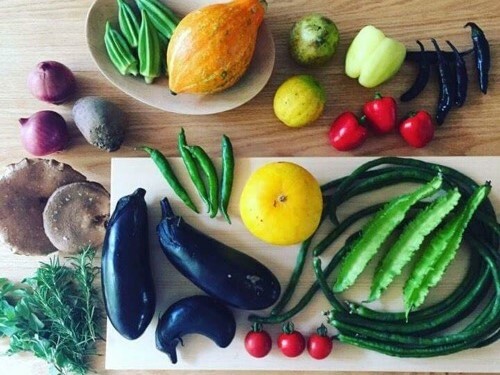 Her mum learned about macrobiotic diets during her pregnancy, and since then it was been her wish for her child to be healthy with food provided from reliable and safe sources. 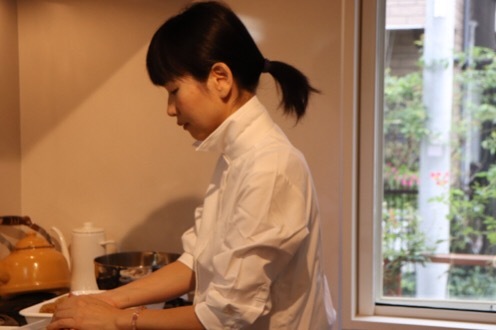 When Ms. Asada was pregnant while stationed in Hong Kong, she also wanted to study about macrobiotic food and she gained a wide knowledge by herself through reading books. When she came back to Japan, she became a student at the Kushi Macrobiotics School and after that she worked for many well-established vegetarian restaurants. She learned a lot especially from working as a personal chef. you are required to instantly plan and implement and I have learned to handle these types of situation. I am thankful for the experience and now I am able to prepare food without wasting any seasonal vegetables while preparing food at Lito Rukka”. The Vegewell interview team asked her about what she keeps in mind while cooking. She replied that “I want to make the most taste from the ingredients. For example, Daikon radish tastes either sharp or mild depending on different seasons. I want to add less seasoning so that customers can taste the original flavors. The idea of opening Lito Rukka started when Ms. Asada coincidently reunited with Ms. Matsuura (who is now the owner of Lito Rukka). When we asked the owner what does she wish for the restaurant in future? “We want more people to know about the variety of vegetables and vegetable dishes. And that vegetarian food without any animal ingredients can be so delicious. Also I want to raise awareness about our environment. Why don’t you place a reservation and enjoy a heart-warming time at Lito Rukka and value some me time?